He remains under scrutiny after a suspension for disputed use of an asthma medicine, but Norwegian skier Martin Johnsrud Sundby felt he really could celebrate over the weekend. It brought him another World Cup victory when he won an important 30-kilometer race in Davos, and confirmed the comeback he’s been yearning for. “This is really great,” Sundby said after beating teammate Anders Gløersen by 13.7 seconds. Matti Heikkinen of Finland was third. The victory in Davos was especially significant, because that’s where Sundby’s doping nightmare began, in December 2014. Testing conducted right after a race there showed levels of salbutamol, the active ingredient in his asthma medicine, that were too high. That led to a lengthy investigation and appeals that were kept quiet until this past summer, when a court of arbitration concluded Sundby had broken WADA rules and had been excluded from competition for two months. Sundby also lost his medals from the Tour de Ski and overall World Cup for the 2014-2015 season and he was crushed. He claimed innocence, but ended up dropping a final appeal. Better, he figured, to just carry on in the new ski season. The now-32-year-old skier won back home in Lillehammer last weekend, too, a victory that moved him to tears in describing how much it meant to him and his family that he could still ski fast and well after all the doping trauma, which he described as “the toughest fight” of all: “Managing to fight back and stand on the top of the winners’ platform again hasn’t been anything we’ve taken for granted.” Sundby described, with his three-year-old son Markus sitting in his lap, how his family had fought to clear his reputation and motivate his skiing, too. The doping scandals that have involved both Sundby and Therese Johaug, two of Norway’s top skiers, have also sparked criticism and even disdain from some other competitors. The Norwegian teams of men and women skier have dominated the sport for so long, and the doping results, however unintentional they may have been, have unleashed no small amount of vitriol. 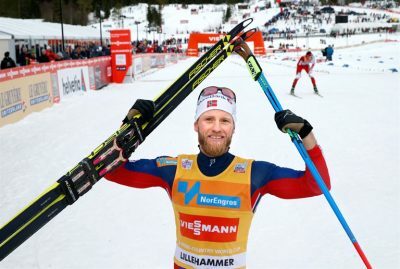 Sundby was still subjected to what some commentators called “hatred” in Swedish and Finnish media after winning a 15-kilometer World Cup race in Lillehammer. “Where is this hatred against Norway coming from?” queried one commentator for Swedish TV, who called upon fellow Swedes to restrain themselves. Others have pointed out, though, that Sundby got off a lot easier than Johaug, who faces a 14-month suspension after testing positive for a steroid found in a cream she used to treat sunburn blisters on her lips last summer. Her test results were also released immediately, while Sundby’s were withheld while his appeals proceeded. “Neither Sundby nor Skiforbundet (Norway’s national skiing federation) said a word,” wrote Aftenposten commentator Ola Bernhus recently. They’d figured, wrongly, that Sundby’s case would blow over and he’d be acquitted. He wasn’t, but he was punished more mildly for his use of asthma medicine than Johaug, who was found to be negligent in ignoring warnings on the package of her lip cream. Sundby also has been criticized this season for refusing to speak to a TV2 reporter whom Sundby felt had been too opinionated in his coverage of the doping case. The ski team’s main sponsor didn’t back Sundby’s boycott and the skiing federation quickly responded, forcing Sundby to drop it. “As a matter of principle, we think it’s wise to be inclusive and practice both humility and openness,” the chief executive of main sponsor Sparebank 1, Jon Oluf Brodersen, told Trondheim newspaper Adresseavisen. That applied to ski star Sundby, too.